Completely intuitive presentation of data in this theme helps wisely arrange great amount of content and browse it easily. Two sliders (Camera image and text slider, Carousel images slider) showcase images from the gallery that offers to browse a variety of them with nice zoom effect. Featured blocks of content, widgetized areas make the structure of the theme intelligible. The colored background helps divide the content into sections. Yellow color in menu, buttons, headings draws attention to certain parts of the theme. Can I use graphics from WordPress theme for Organic Farm Supplies Company I purchased for use in printing? If you purchase the product at a â€˜Unique price' it guarantees that you are the first and the last person to buy this Dairy Farm WP template from us. It means that this template has not been sold before and you become an owner of a unique design. After this kind of purchase the template is being permanently removed from our sales directory and is never available to other customers again. The unique purchase license allows you to develop the unlimited number of projects based on this template, but the template should be customized differently for every project. If you purchase the product at a â€˜Buyout price' it guarantees that you are the last person to buy this template from us. It means that this WP theme for Agriculture Farming may have been sold before a couple of times (see â€˜Downloads' number in item's properties) but only you and people who bought the template before you will own it. After this kind of purchase the template is being permanently removed from our sales directory and is never available to other customers again. The buyout purchase license allows you to develop the unlimited number of projects based on this template, but the template should be customized differently for every project. 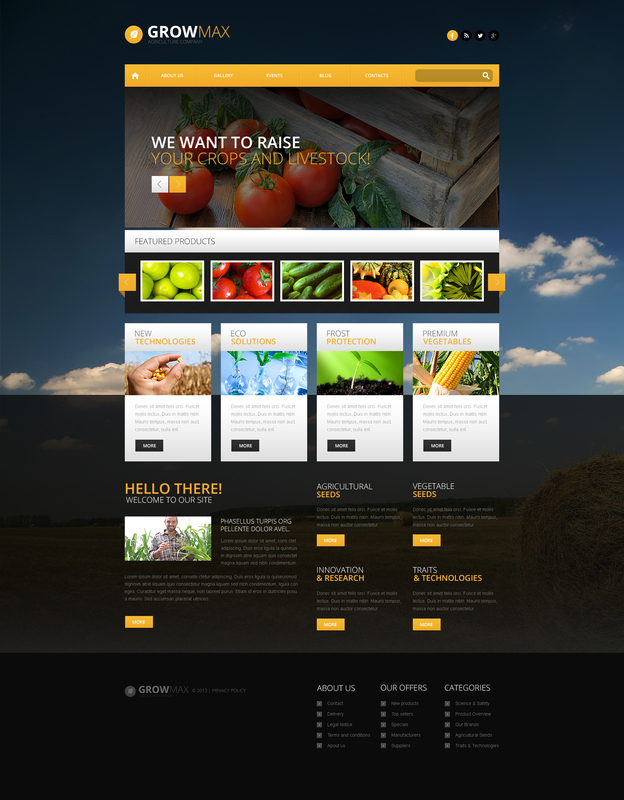 After WP theme for Organic Farm purchase you can put your copyright to the template. But you cannot place a line at the bottom (or any other spot) of the customized project saying "Website design by Company name". Nevertheless, you can place "Customized by Company name". MANI DIGITAL VENTURES S. A. DE C. V.
Nice template, the only thing missing is a proper color management. Besides that, I can recommend this template with no issue at all. The slider works great and is really easy to setup. I would recommend to add a little more personalization on the color side, with that solved, this could be an awesome 5-star template. Also, te team has been really helpful with all the fixes I needed to make in order to fulfill my expectations. Es una plantilla muy bonita. Estoy implement&aacute;ndola para una empresa de exportaci&oacute;n y va quedando muy bien. Soy desarrollador Web y no tengo mucha experiencia dise&ntilde;ando interfaces, por lo cual las plantillas me ayudan de gran manera. Ademas es adaptable a diferentes dispositivos lo cual ahorra una gran tarea. He tenido algunos problemas con identificar en que lugares debo de ingresar la informaci&oacute;n para que se visualice tal cual el ejemplo, pero ante los problemas el soporte de ayuda de Monster Template me han dado las pautas para solucionar mis problemas. Estoy retomando WordPress despu&eacute;s de mucho pero las interfaces de configuraci&oacute;n de la plantilla son muy amigables. Easy to change into whatever color scheme you need for your project. Excellent design, programming and easy programming. how could i demostrate this site template to my customer ??? Can the color of the menu bar in theme 46545 be changed to a different color some where in the template? Or in CSS? What other changes can be made in the CSS? $199 Online Store option is powered by template conversion into WordPress and WooCommerce plugin integration. As a result you will get a functional online store implemented as Shop button in menu. The service is completed within 6 business days.